Foxconn's Green Bay "innovation center," still occupied by other businesses. A Milwaukee "innovation center," intended to staff 500 workers and realize Foxconn's "AI 8K+5G vision," was found with unused conference rooms and minimal staff as recently as mid-March, according to The Verge. Some of the people refused to talk to the press, while others wouldn't confirm or deny their employer. Permit applications have been made for about $60,000 in renovations, but mostly for three floors being temporarily occupied a financial services firm, Baird. When a Verge reporter called the architect at the head of the firm leading the redesign project, he hung up after learning the story was about Foxconn, and never returned follow-ups. In the town of Eau Claire, a lab and a co-working space both announced as opening in early 2019 were discovered to be not only unoccupied but still under construction, and one of them not even bought or leased by Foxconn. 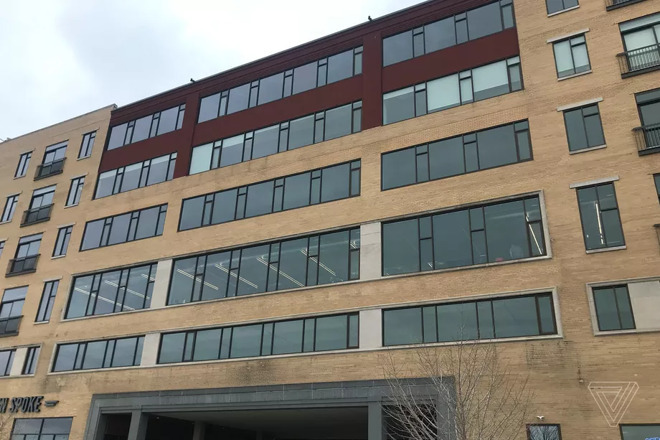 The building's owner wanted to turn floors three through six into apartments, but Foxconn repeatedly laid claim to the third floor only to change its mind, also asking for extensions. The company was finally turned away when it tried to renegotiate its contract and pay $500,000 less. A waterfront innnovation center in Green Bay likewise showed no sign of Foxconn, even though it did buy necessary buildings. In fact the center still had tenants including a children's museum, a bike shop, an architecture firm, and a brunch restaurant. Similar situations are said to be playing out across Wisconsin. One source described the innovation centers as WeWork-style co-working locations, apparently in contradiction with claims made by Foxconn and former Republican Governor Scott Walker. In the suburb of Mount Pleasant near Racine, Foxconn's main Wisconsin complex -- occupying 800 acres -- is still mostly barren except for a "multipurpose" warehouse, and construction work has halted for three to four months. The city has moreover been accused of threatening eminent domain action to seize land from private homeowners, though some have already sold and moved out. Foxconn has promised to complete a factory by the end of 2020. At one point the company promised that 13,000 jobs would be created in Wisconsin, but it's still unclear what those people might be doing. The original claim was LCD manufacturing, but that has shifted into a blend with "AI 8K+5G" research. At one point Foxconn admitted it couldn't build LCDs in Wisconsin and stay competitive. During the LCD phase, there was brief speculation that Apple could become a client. Foxconn's Wisconsin efforts could be a Chinese-style "state visit project," said Harvard business school professor Willy Shih. The idea is that with a preliminary announcement, politicians can be seen as helping jobs and the economy, while businesses generate political goodwill -- but the latter ultimately get to do whatever they want, including nothing if it's better for their bottom line. In fact Foxconn has been accused of this in other places such as Brazil and Pennsylvania. A major difference in Wisconsin is that Gov. Walker offered $4.5 billion in subsidies, and taxpayers have already spent over $300 million on land and infrastructure. Mount Pleasant took on debt to offer a $763 million incentive package, and its costs are now closer to $1 billion. Either way Foxconn's project is being treated as a political football. Trump attended the groundbreaking ceremony for the Mount Pleasant facility, touting it as evidence that he's creating U.S. jobs. Walker's replacement, Democrat Tony Evers, promised to hold Foxconn accountable, but in exiting office Walker signed a bill moving Foxconn's liason out of the governor's purview into the Wisconsin Economic Development Corporation. He also made it impossible for Evers to choose a new WEDC CEO until this September. State House Minority Leader Gordon Hintz, a Democrat, believes that Foxconn may be trying to drag out the project until the 2020 Presidential elections, using it to curry favor with Trump in the middle of his ongoing U.S.-China trade war. After Foxconn's "efforts" in Brazil, this should surprise no-one. Isn’t Chinese companies use to making large city buildings that are almost empty? Actually, don't Chinese companies use to make huge cities that are almost empty? After initial hearing rumors that HH was going to start a large-scale manufacturing facility in the US, I was huge skeptical because producing anything in the US, whether it be a bouncy ball to a computer, would be immensely more expensive in the US due to the huge labor costs and the extreme laziness of Americans (myself included), so I was shocked when HH announced plans. And when HH changed it to being a research facility, I thought that I was (somewhat) right in my initial skepticism, but it seems that the largely empty buildings are still a pipe dream. Maybe in the future. Even a research facility would be more expensive in the US, but the US has talent so maybe ok, but in Michigan? Not that much to fill many large buildings. Well, when you get politics involved in something that should be a business decision this is what happens. Foxconn could build a highly automated production facility in Wisconsin that could eek out OK margins on product. Of course, that would defeat the whole ‘jobs’ program politicians want. Hiring R&D type folk might be a better bet because the U.S. has a lot of talent in that department. But then Wisconsin has another problem to deal with. Who amongst those R&D types wants to move to Wisconsin as opposed to living on the coasts? Guys, you want those high tech jobs in your states? Then do something to make them attractive to those types of people. I’m talking lifestyle changes like a vibrant downtown, bikeways throughout the city, nearby bicycle and hiking trails, rafting and canoeing in the great outdoors (they’ve got a few lakes ya know). Use your assets guys. Promote them! I’m surprised that Foxconn hasn’t blamed low sales of iPhones for this. Sooner or later someone will bring up Apple’s name when it comes to finding out who is at fault. Foxconn makes electronics for a bunch of other companies as well, but when things got slow for them they blamed Apple. Thanks for not being political. Foxconn is not a Chinese company. Saw this coming from day one. This whole deal was political and divisive from the get go. It's basic capitalism. More advanced economies don't keep low skill jobs. They ship them out. More advanced economies are more expensive to produce goods in. I'm not sure laziness has anything directly to do with it. I know and see tradespeople every day who work very hard for a middle-class paycheck. But no doubt they need a middle-class paycheck to survive decently in an advanced economy. The problem facing this country will be that we won't have enough low skilled jobs available for the low skilled citizens. This is an issue in every advanced economy. But of course, this was a political game being played using tax dollars to make certain politicians look like they are doing something for low skilled workers. The truth is low skilled workers are going to face ever growing problems. I am so happy that no other deals like this have been political. There were definitely games being played. 'wink wink nudge nudge'. Of course, no large advanced tech firm is moving to WI to open anything at that scale. Finding skilled talent is THE issue. What this was about is much simpler. They pretended it was going to be a home for unskilled, factory style jobs that would somehow pay middle-class wages. This was the lie. Everyone knew it. It was played out to get certain groups of people to believe that certain politicians had their back. They were conned. Do you guys remember the last president that was voted in? He pandered to certain groups all the time. Just wondering if the water takes different were your at. I thought we were bad in my country. This whole thing was a stunt from jump street and smelled from the start. I myself am opposed to governments of any level giving away stuff to attract any business to come or stay- if it takes a stunt to get them it will take a stunt to keep them. This would be my view regardless of the politicians or party involved. In my hometown, we have a Japanese plant that was lured here by a former Governor who grossly overpromised to the company. He told them our community had a large supply of well-educated workers that could be had on the cheap, when the truth was we have a supply of well-educated workers and then a supply of less-educated workers who will work on the cheap. They quickly found out the kind of people they wanted already had jobs paying more than they were offering and the kind of people they could get for that price had minimal job skills and many had little or no previous experience in manufacturing. Call me crazy, but a private for-profit business should locate their facilities where the business conditions dictate and they should pay the prevailing costs. Governments should not subsidize for-profit companies in general. ... Did anyone ever really believe that Wisconsin would even be capable of supporting 13,000 high tech jobs? Sure, why not. Wisconsin has a number of very good engineering colleges (several University of Wisconsin campuses, Marquette University, MSOE) and is within a relatively short distance of many others including Northwestern, Notre Dame, U of Michigan, Illinois, Purdue, etc. That region of the country and Wisconsin in particular has a long history of machinery manufacturing (construction, farming, mining, paper making, transportation), automotive manufacturing, medical systems, instrumentation, factory automation, building automation, shipbuilding, etc. Oh, and making beer and cheese. The problem I have with this Foxxconn deal is that it sounds like just another short term focused way to get US taxpayers to buy temporary jobs for other US workers. If the work that was being done would ultimately benefit the taxpayers, like infrastructure improvements, no problem. But if all their doing is subsidizing costs for a private company (Foxxconn) so Foxxconn can afford to locate an operation in the US that would otherwise be uncompetitive in a globally competitive market, what is the long term benefit to US taxpayers or to the affected workers? As soon as the subsidies run out, so will Foxxconn, and the workers will be back looking for new jobs with potentially untransferable skills, just like what happened when they got whacked when the last place they worked was shuttered because it could not compete in a global economy. Short term thinking almost always leads to long term disaster. There’s nothing inherent within “more advanced economies” that prevents low skill jobs from being created. It is the existence of the economically artificial and politically driven minimum wage that keeps low skilled workers at home. Which is a shame because there’s a compelling economic and humanitarian argument to permit low skilled workers employment opportunities not currently available to them. But the body politic would rather they sit idly at home. Trump made it about himself and his business acumen throughout the election and the first 18 months of his administration.